Content marketing has proven itself time and time again to be an effective strategy. I love content because it sends me leads, doesn’t have that icky selling feeling, and my first love is writing! Content is great, but writing is half the battle. There’s a lot that goes into having an effective content strategy. You want content you love to create but also content that converts! Plus, you don’t want to waste time making mistakes that hurt your business. Make sure you aren’t doing any of these! We’re all guilty of this (including me!). When life gets in the way or client work piles up, we neglect growing our own business. 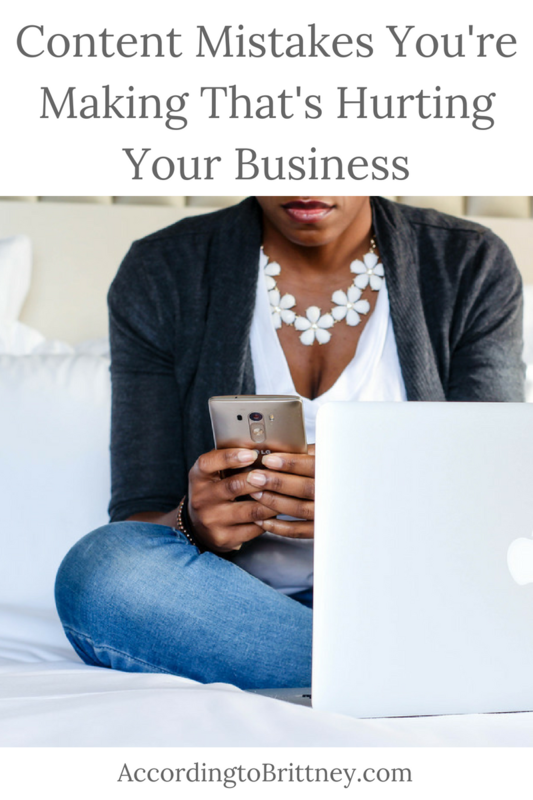 This mistake is costing you visibility in your business! Without visibility, how will your people find you? To prevent inconsistency, batch and schedule your content so that you always have content on hand and don’t have to manually post all of your content. Create a calendar to help you keep track of topics you want to cover weekly or monthly. If you’e not saying something your audience can relate to or learn from, why should they read it? Content is all about engaging people. You want to offer something great to your audience to keep them reading and eventually buying. Think about what you do in your business. How do you help people? What’s the process like? Why is it important to your audience? Use the answer to those questions to create something your audience will love. For example, this post! I’m a content writer helping people identify problems with their content! Does your content sound like anyone could of wrote it? Well, then why should your audience gravitate towards you and not someone else? Make your content unique to you or your personality to keep people engaged with your content. What does personality look like? You know better than me! Are you witty or like to have fun with your writing? You could use certain writing or emojis on social that makes your content pop! Don’t forget how your brand comes into play with images and video! Why is a content writer telling you that you’re creating too much content? Here’s why. If you’re a solopreneurs who’s team consists you and your cat, you might be doing a lot at once. My philosophy is quality content is better than a ton of content. Why come back to something you didn’t like? Focus on 2-4 platforms that you will focus on creating new and amazing content for. For me, that’s my blog, email list, Instagram and Facebook group. Everywhere else can be repurposed content and posted to less frequently. My examples, Twitter, Facebook page, and Pinterest. We all make content mistakes, but learning how to make better content is easy. In fact, my signature program, Content Creation Academy (CCA), helps entrepreneurs build their influence, visibility and engaged audience through content marketing! CCA is a membership community that provides you with all the tools you need to take your content to the next level including: weekly trainings, supportive exclusive FB group, updated resources and guides to make content creation easier, group planning sessions and even 1:1 strategy sessions with me! Learn about how to join the Content Creation Academy here. We’re accepting new members until the 15th!